After the cable modem is successfully registered on the network, the Power, US/DS, and Online indicators illuminate continuously to indicate that the cable modem is online and fully operational. For more details, refer to the Modem Lights section. The Arris DG2460 has the following ports available on the back of the modem. Reset - Use this button to reboot the modem. To restore factory defaults, press and hold the Reset button for more than 15 seconds. This button is recessed to prevent accidental resets. Ethernet (1 - 4) - Connects to the Ethernet port on your computer. 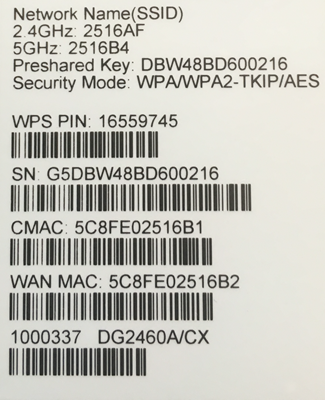 This label is located on the bottom of the device, which contains the default Network Name (SSID) and Passphrase (Preshared Key). The modem lights indicate the current status of your WiFi cable modem. To troubleshoot any connection problems, use the table below. See Rear Panel Modem Lights to view lights related to the Ethernet connection. Off No Power. Verify all cable connections and try resetting the modem. If cable is OK and modem reset does not work, contact Customer Support. Flashing Downstream and upstream channel acquisition in progress. Verify all cable connections and try resetting the modem. If cable is OK and modem reset does not work, contact Customer Support. Off Internet is not available. Verify all cable connections and try resetting the modem. If cable is OK and modem reset does not work, contact Customer Support. On None. 2.4 GHz WiFi frequency is enabled. Flashing None. Activity with connected device. Off WiFi is disabled. Reset the wireless settings to default. See page 32 of the User Guide (PDF). On None. 5 GHz WiFi frequency is enabled. WPS Off None. WPS is disabled. On None. WPS is enabled. WPS Button N/A There is no LED on the button. The lights below indicate the Ethernet connection status of your modem. To troubleshoot wired connection problems, use the table below. Ethernet Off Device is not connected to the port. Verify all cable connections and try resetting the modem. If cable is OK and modem reset does not work, contact Customer Support. For more detailed technical information on the DG2460, use the resources below from Arris.